Champion jockey G.R. Carter, Jr., getting his second stakes of the day under Fast Prize Mike in the Eastex Handicap. 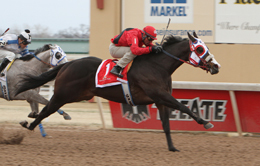 OKLAHOMA CITY, OK�MARCH 10, 2013�The Opening Weekend of the 2013 Remington Park American Quarter Horse & Mixed-Breed Season closed Sunday afternoon with Royal Vista Ranch sire PYC PAINT YOUR WAGON getting two more stakes winners. The leading sire now has 37 stakes winners and earners of nearly $9 million. The Grade 2, $50,000 Eastex Handicap, the traditional first graded stakes event of the meeting, was won by Fast Prize Mike, holding on for a neck victory over Eufaula Me. Owned by Evelio Salazar of Sugarland, Texas and trained by Steven Salazar, Fast Prize Mike was ridden by G.R. Carter. The 4-year-old horse grabbed the lead midway through the 350-yard race and held on to cross the line in :17.276 over a fast track. Away at 6-1 odds in the wagering, Fast Prize Mike paid $14.40 to win, $8.60 to place and $7.40 to show. Eufaula Me paid $8.40 to place and $5.40 to show. Kool Country Man was third and paid $7.20 to show. A Toss Up, the beaten 5/2 wagering favorite, was fourth. 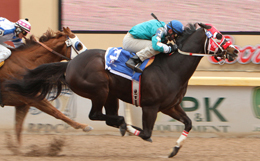 Fast Prize Mike, a 4-year-old horse by PYC PAINT YOUR WAGON from the Heza Fast Man mare Fast Mans Prize, won his fourth career race from 13 starts and his third Remington Park race. The winner�s share of $32,284 pushed the lifetime earnings for Fast Prize Mike to $134,615. Completing the field were A Toss Up, Teller More, Mr Taka B, First Klas Fred, Katillac Man and Zoomandkicken. Honor Me Good was scratched. The Eastex Handicap is named in honor of the 1984 All American Futurity winners and multiple American Quarter Horse Association divisional champion. At the time of his retirement at the end of his 1987 season, Eastex was the all-time earnings leader in the sport. Weetona Stanley, of Madill, Okla., bred Fast Prize Mike. She is also the breeder of another triumphant 4-year-old horse on Sunday, Fast Prize Jordan, who won the $55,000 Mighty Deck Three Handicap. Fast Prize Jordan, under G.R. Carter, Jr., winning the Mighty Deck Three Handicap on Sunday. Fast Prize Jordan won the race preceding the Eastex, pulling clear to a three-quarter length win over Finche, the 2011 winner of the Mighty Deck Three Handicap. Cruzin The Wagon was a nose behind the runner-up in third. Owned in partnership by Stanley and W.E. Smith, Fast Prize Jordan is trained by Brian Muse and was ridden by Carter. Fast Prize Jordan handled 250 yards in :12.919 seconds and paid $10.40 to win, $6.80 to place and $4.60 to show at odds of 4-1. Finche returned $5.40 to place and $4.20 to show. Cruzin The Wagon paid $3.20 to show. Another 4-year-old horse by PYC PAINT YOUR WAGON, Fast Prize Jordan is from the Mr Jess Perry mare Fast Prize Doll. The Mighty Deck Three, restricted to older Oklahoma-breds, was his fifth career win from 10 starts and his third at Remington Park. The winner�s check of $32,230 moves his overall earnings to $137,291. Wagons West, Senor Fish, Wr Dialuppappa, Thru The Fire, Binky Beduino, Wr Dashin On My Mind and Oh Spit N Run completed the field. The Mighty Deck Three Handicap is named in honor of 1980 AQHA Champion 2-year-old Mighty Deck Three who won many of the top 2-year-old races that year including the Rainbow Futurity at Ruidoso Downs.